Lets start from the beginning. This was a welcome Christmas present as I'm starting to grow an appreciation for Glen Garioch especially for bottlings prior to its mothballing in 1995. Why? Well once it reopened in 1997, it had been renovated and the malt characteristics had changed. What was previously more peated was now light and fruity. Still, enjoyable nevertheless, but I can see why some of the 70's and 80's bottlings from the distillery are so popular. Who is Andrew Fairlie? Good question for those outside of the UK and one I'll have to answer. He's a chef and on paper (in Michelin star terms) head of the best restaurant in Scotland. Unlike Gordon Ramsay, if you visit his restaurant there is a high chance he'll actually be behind the stove. It's not cheap given the standard it sets and is one establishment you do have to book well in advance. Based within the luxurious confines of Gleneagles, the setting is very plush although the room itself could do with some natural lighting. Gleneagles at the time of this bottling was owned by Diageo so I find it ironic to celebrate such a prestigious event, they had to bottle a Suntory distillery cask and from an independent bottler as well! Living in Fife golf is everywhere. So the marriage of whisky and golf (as seen recently at Kingsbarns distillery) is a logical relationship. I know from my Fairlie visit one evening the wine list was fantastic but the whisky a little lacking. Since then they've sought to address this thanks to the assistance of independent bottler Adelphi. This 10cl in some eyes wasn't cheap at £25-£30 but given the age and event it does come with a premium attached. Nose: right up a great combination of cinnamon and dark chocolate. Plump cherries, sticky figs and sun ripened cherry tomatoes. An aromatic mixture of walnuts, treacle, thyme and Black Forest Gateau. Taste: an initial burst of sweet and then a symphony of flavours. In some ways this reminds me of an old skool Macallan with more cherries and dark chocolate. A rusty spoon element, cloves, star anise, raisins and that leather armchair I keep promising myself. 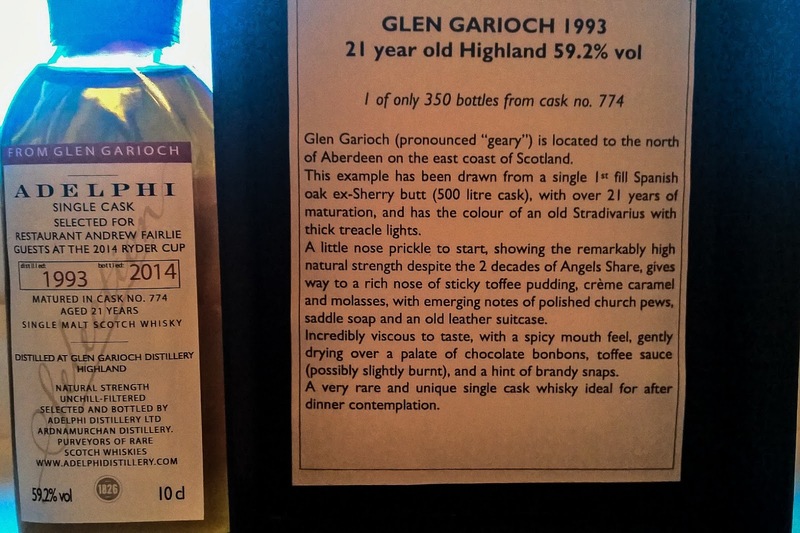 Overall: delicious and one of the best examples of a Glen Garioch I've experienced. A fine sherry cask can work wonders as I've seen before with the Deanston 37 year old here.